So who, in the end, screwed whom? John Williamson can barely open his mouth to breathe, such is the flow of words from David Fleeshman’s Shelley Levene. But Levene is pathetic, imploring Williamson to feed him the premium leads. Williamson is unmoved; to get the leads, you need to have made the sales. Success breeds success, and success deserves success. (It’s very New Labour: just think of the predication of Olympic training money on past medals, or of the predication of higher education funding on the short-term impact of research already carried out – and if you’ve not been successful… well…) But maybe there’s an agreement to be made, a deal to be cut. Maybe. Dave Moss has a scheme; if someone were to steal the leads and sell them on to another agency, they’d be set up. And they’d have struck a blow against the bosses. Someone – someone – ought to do that. That someone is George Aaronow. He can be sure of a share of the proceeds in return for executing the plan. Besides: having listened this far, he’s already complicit. There’s no way out. 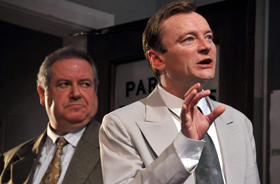 Richard Roma – played expertly by Richard Dormer – is selling. He’s selling opportunities: opportunities to… to what? It doesn’t matter. His patter is predatory, almost sexual in the way that it tantalises Leigh Symonds’ James Lingk. Lingk, of course, doesn’t stand a chance; Roma, the land-grab lothario, has done this many, many times before, and we watch him work on Lingk with exactly the mixture of envy and contempt with which we watch the pickup artist work on the blonde by the bar. The contract is all but signed already. We hate him but – and because – we secretly (or not-so-secretly) want to be him. This is the setup. Of course, things aren’t that straightforward; it wouldn’t be Mamet if they were. Levene is perhaps not so down on his luck after all; we thought that there was something of Arthur Miller’s Willy Loman about him, but that’s perhaps not right: he’s made a sale – and a big one. Is it on one of the leads that Williamson may have sold him? Will it come good? If it’s a Williamson lead, then surely yes… unless… Because what, in the end, is the relationship between Levene and Williamson? There’s no love lost between them. Williamson is a manager, not a salesman; the term “book-learn’d” is never used, but it’s never quite absent. He’s the next generation; when Levene comments about having worked to put his children through school, there’s a sense that Williamson is (at least figuratively) one of those children: the professional offspring of the real labourer, the salaried child of the wage-and-commission parents. Could it be that Levene hates and fears Williamson for the security that comes with being just one more generation further from the queues at Ellis Island? (How long ago did Misha Levin become Shelly Levene?) And could it be that Williamson hates and must bring down Levene just to prove he’s no milquetoast? So maybe the dénouement of that storyline was planned all along by the professional Williamson as a trap for Levene. He’s probably capable, echoing as he does Goldberg from Pinter’s The Birthday Party (although Paul Barnhill’s performance, perhaps just because of the glasses the costume department has given him, brings a slightly unfortunate whiff of the Herr Flick to it as well). Or is Levene wrong when he accuses his tormentor of not being able to think on his feet? Is Williamson perhaps the most deft mover in the play, able to spot one dropped word and thereby assure his mastery over all the mere hacks whose work he organises? Roma, by contrast, seems to be secure in Act 1 – but by Act 2, there’s something amiss. His luck isn’t what it ought to be. Somewhere just underneath, there’s something else. Our fascination is caught by something just in the corner of our eye: a fleeting image of a future Loman here, too – but also of a Lehman Brothers, of an Enron, of a Madoff. Lingk will never best him, but Lingk’s unseen wife may; and, when she does, Roma will be as helpless – justly so – as her husband had been the day before. And as for Moss and Aaronow: well, the office has been burgled – so why are they here? Moss, actually, has almost nothing to say after his vignette in Act 1. Is this because he’s a minor character after all? Or maybe he’s a very major one indeed – yet not so major as to be invulnerable. And Aaronow? James Quinn looks a little lost at times in the role – but, then again, Aaronow is more than a little lost most of the time as well. He’s nothing. We know that, when the curtain has come down, he’ll be standing in the hallway, turning around, open-mouthed, watching as the lawyers carry box after box out of the building with them. He’s biddable, but harmless at the core; we have a sense that his destruction will be complete, and this is why we hold him in such contempt. And us, then? Where does that leave us? Because, if Aaronow is complicit for merely having heard, then why not us? There can be no doubt that David Mamet is one of the world’s best playwrights, with a magnificent and gleeful understanding of the sometimes violent rhythm of speech. 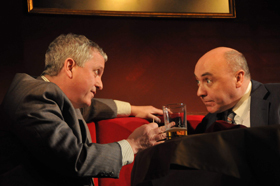 In his work one will find Miller and Pinter, but plenty of Shakespeare – Williamson as Iago, perhaps? – and a Sartrean commitment to the inevitability of brutal, interminable conflict between agents. 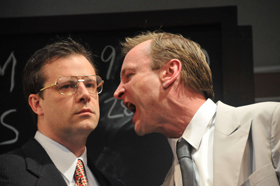 Glengarry Glen Ross takes about 80 minutes to perform, but the detail is minute, and it is immensely disquieting. Mamet is a moralist of some sort, but it’s hard to tell exactly of what sort. He’s a tragedian, too – but he plays a three card monte with the tragedy and thereby makes a kind of comedy of it. Ostensibly, the laughs come from the badinage on the stage; but it’s quite possible that the joke’s on us.